…uh…what war?…what gas prices? …”CPR for the dead of night” (marketing tagline – how goth!) – what does that mean??? Exactly what do you want to resuscitate? How buffered do you have to be to WANT this car (or any brand-spanking-new-gas-guzzling SUV) and to have the time in the middle of the day (before lunch hour) to report to a falderal for the Ford Flex? I work nearby where this event took place and I watched in bewilderment over the wrong-place-wrong-time callousness of this event. 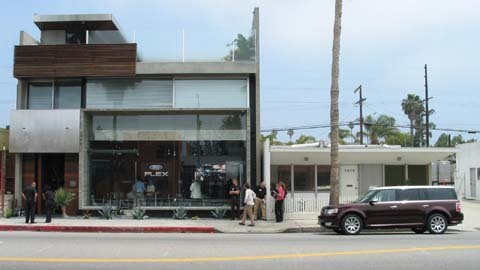 Nevermind that after over 5 years of America at war in Iraq, Ford Motor lacks the foresight NOT to produce a tank of a vehicle, but to come to eco-conscious Venice Beach to launch this 4-wheeled totem of conspicuous consumption is brazen. What an incongruous coincidence that this event was just 2 doors down from the Smart Car launch – having observed both, I can tell you one was a crowded party with live music and the other looked like an EST meeting…guess. It’s no wonder to me Flex marketers are desperately targeting the narcissistic, independently-wealthy bachelor demographic because we all know that anyone with a conscience or a budget wouldn’t be caught dead in one – even though there’s room for the coffin. You are clueless. Some of us have 3 kids and need a sensible option. 3 carseats do not fit in vehicles without a 3rd seat. This offers better fuel economy that SUVs or minivans. You are too self-absorbed. I can see that you work for Ford and if this is your sales approach it’s not working on me. Wow, don’t they make normal sedans in the US? Speaking of self-absorbed.